THPBlog: Sierra Pacific Industries to log by Malakoff Diggins State Park NE of Nevada City, CA. Sierra Pacific Industries to log by Malakoff Diggins State Park NE of Nevada City, CA. 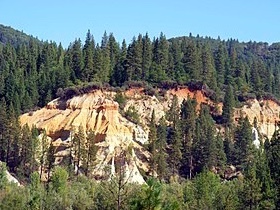 This THP is about 9 miles NE of Nevada City, CA and a few miles north of the South Fork of the Yuba River by Malakoff Diggins State Park (unit 0101 is within 200 feet) at an elevation of 2,800 to 4,800 feet. Sierra Pacific Industries is proposing a tractor and cable logging operation on steep and unstable slopes in white fir, ponderosa pine, sugar pine, Douglas fir and incense cedar forests. There are 2 unstable areas in section 25 that appeared after severe weather during the winter of 2017. SPI is planning to use and construct roads, landings and crossings during the winter period, and use an existing road and landing inside a class III (intermittent) watercourse area near unit 27-0309. Seven foothill yellow legged frog sightings were reported near the THP area ranging from .01 to 1.52 miles away. In 2016, a California spotted owl was reported in section 3, within .1 miles of the nearest THP unit, and in 1990, a California spotted owl was reported in section 12, within .15 miles of the nearest THP unit. In 1998, a northern goshawk was reported in section 13, within 1.2 miles of the nearest THP unit, and in 2000, a Sierra Nevada yellow legged frog was reported at Poorman Creek within .66 miles of the nearest THP unit. 2,300 feet of the Missouri Bar Trail passes through the THP area in section 7.